The list of artists who’d go on to make a notable impact on rock ‘n’ roll yet who already had years of experience before rock came along is a relatively short one. Oh, there were definitely some, a few of whom we’ve already met, who had established themselves in another field and briefly joined in the fun when rock came along, releasing a side or two that fit comfortably into that realm, but a lot of them would view it only as a brief stylistic diversion before returning the environs they were more comfortable in. Call it curiosity, an experiment or even a mid-life crisis if you want, the resulting forays for most of them would best be described as a fling rather than a heated affair. But there were also some, like Tiny Bradshaw, who seemed to fall in love with the racy young gal the moment they laid eyes on her shapely figure and soon left their musical wife and family to start a full-fledged relationship with the enchanting vixen – age difference and disparate backgrounds be damned. Whatever long odds were posted for such an improbable union lasting, by all means take them, because in music, as has been shown time and again, when your heart is truly into it things have a way of working out, especially when the suitor in question has talent to spare. Myron “Tiny” Bradshaw was a psychology major in college in the mid-1920’s when he suddenly put down the books, picked up his drum sticks, jumped into a career in music and never looked back. Though it took him awhile to score his first recording session he marked the occasion in 1934 by cutting rousing versions of songs such as Shout, Sister, Shout and Darktown Strutter’s Ball that hinted at his future vocation in rock. Apparently nobody was ready for it yet because he then went a decade without stepping foot in a studio again. How that long draught of opportunity changed his thinking won’t ever be known, but when he finally got another chance to record in the mid-1940’s he tempered his earlier approach and instead focused on treacly ballads such as Butterfly that were definitely not his forte. In contrast to his early days when he seemed raring to go he now seemed utterly lost – his true musical passion wandering around aimlessly in search of an outlet. If ever there was somebody who needed rock ‘n’ roll to be invented just so he could find his place in the world it was Tiny Bradshaw. He’d been at this game for a long time with not much to show for it. Yes, he had a career that put bread on the table and that’s all most in the business could realistically hope for, but musicians have a tendency to hope for more than is realistic. It’s the nature of the profession, where fame and fortune are its siren call and everyone stepping into a recording studio envisions churning out hit upon hit which will make them a household name. Yet at this point in the game Bradshaw was still nowhere near turning that dream into reality. He was entering middle-age, he wasn’t even a B-level star let alone a big-name draw, and the mannered sophisticated styles that seemed most commercially promising at the time for someone of his background weren’t suited to him in the least. If he allowed himself to look out over the horizon and gaze into the future at what likely lay ahead for him he may just have thrown in the towel then and there and opened a barber shop or something. But luckily for us he didn’t. He held on to that dream, convincing himself that as long as he didn’t give up something might still happen to turn things around for him. Then in 1947 “something” did happen. That something was rock ‘n’ roll and as soon as the baby came bursting from the nursery the 42 year old Bradshaw jumped right in the playpen and gleefully made quite a racket himself. He was at home from the moment he joined them. Among the first words we hear Bradshaw utter in the rock ‘n’ roll idiom are “ROCK IT Mr. Piano Player” , urging his band on while the groove picks up steam as the song gets underway. Like James Brown twenty years down the road Bradshaw excelled as the overseer of the proceedings. He’d long since given up his spot behind the drums and was now the bandleader, the songwriter, the vocalist and the visionary who pulled everything together, directing traffic both on stage and in the studio, calling out commands within the confines of the song itself, making it seem as natural as if he were reciting lyrics. When he finally does start singing on Take The Hands Off The Clock the lyrics are the epitome of the freewheeling carousing spirit rock ‘n’ roll would thrive on ever after. From the word go, or more accurately the word “hey”, he’s fully committed. This isn’t someone skeptically trying on a suit of clothes to find out if they fit and nervously eying himself in the mirror to see if he looks right in them, he KNOWS he’ll look sharp as soon as he spots them on the rack and he can’t wait to slip the threads on, head out on the town and show them off. He’s gonna have the time of his life and is itching to get started and when he does hit the hottest nightspots he can barely contain his enthusiasm as he growls, coos, snorts and squeals with delight throughout. It’s a joy to listen to him finally get the chance to break free of the musical shackles he’d been constricted by for so long. If anything though the band begins to let him down, or truthfully since he was the bandleader he lets himself down by not emphasizing them cutting loose enough behind him. But even here it’s notable that while they’re definitely restrained, they’re not exactly playing refined “proper” arrangements in the way the chroniclers of musical good taste of the day would demand… or for that matter the way he himself had been playing just a few years earlier in his misguided attempt to conform to the standards of the day. So quite thankfully there’s no big band sweetness to be found around these parts, but nor is there unhinged wailing away by the instruments either which would propel this into an even higher realm. In effect they seem to be just carrying along the melody, with only the piano really standing out, so that the real excitement can be found in Bradshaw’s vocals. In that sense he doesn’t disappoint. Let’s Romp And Stomp, I Mean Everybody Rock! Bradshaw was never the most skilled singer and wouldn’t have claimed otherwise himself. In fact in his exuberance he was prone to having his voice crack when reaching for a note, as it does here once, like a man in the dark expecting to find a step where there is none and lurching forward suddenly almost losing his balance. But like them Tiny quickly regains his footing and soldiers on ahead, oblivious to everything around him, having a ball and expecting… even insisting… that you do too. Somewhat surprisingly you actually do. With his sudden piercing cries of exultation, his roll call of food and drink for the party – and make no mistake about it, this is a down home bash, no silverware or fine linens here – his sheer gusto for the whole raucous affair is contagious. He lets loose with questions to his “guests” asking them “Are you rockin?”, as if he can’t imagine why on earth they wouldn’t be. Forty-two years old and he’s acting like a man half that age, with no self-consciousness or ill-fitting awkwardness about him. Years before Rufus Thomas would be referred to as The World’s Oldest Teenager while scoring dance themed hits well into his 50’s, the same moniker fits Bradshaw to a T. This half-assed but joyous record is his coming out party. Before anyone gets carried away I don’t want to make this into more than it is. As a song goes it’s merely serviceable. If broken down and sold for parts the individual elements of this wouldn’t get much on the open market. The lyrics may not be ad-libbed but if they were it’d be difficult to spot the difference. The band adds little to the arrangement and seems to be merely trying to keep out of the way of a singer whose demented enthusiasm would draw more laughs than raves at any karaoke bar in existence. At times you expect this to morph into a video of somebody’s crazy uncle with too many drinks in him at a New Year’s Eve party, an embarrassing night destined to never be lived down in the age of Youtube. Yet in Bradshaw’s hands it never does. Somehow despite careening recklessly around the corners at every turn he manages to keep this on track, never letting up on the infectious spirit until he sees that you’re a willing participant in the whole cockeyed affair too. As a bandleader he knows precisely what he’s doing in spite of his carefree outward demeanor as he keeps the band squarely in the groove throughout, its stop/start design lending itself to his joyous declarations and shouts of encouragement. The structure may be flimsy but it holds together in spite of itself. So while the song on paper is nothing much, as a record it’s never less than enjoyable. In the process Take The Hands Off The Clock – as unlikely as it seems – winds up being quite an appropriate statement of intent for the entire musical genre it celebrates. For the generation coming of age at the time who will spearhead the rock ‘n’ roll movement of the late 1940’s the music was a declaration of cultural freedom that signaled a new age on the horizon, the voice of ego, ambition and optimism that seems to be the exclusive province of youth. Yet mixed among them were a few grizzled old prospectors who’d fallen woefully out of step with their own generation and were in danger of never fulfilling their dreams, yet they clung to that ambition and optimism long past the time they would’ve been expected to give it up and in rock ‘n’ roll they discovered their salvation. A musical distillation of the fountain of youth whose restorative powers were evident so long as you embraced it wholeheartedly. In the coming years most of those belonging to the era which preceded rock would look down upon this unruly racket with condescension, thinking the bedlam it produced was an affront to everything they held dear. But then there were those like Tiny Bradshaw, who, more than twenty years after he’d left school and a put the promise of a respectable career behind him in order to pursue music, and over a decade since he first heard his band on wax, finally found his calling. He’d simply been waiting for it to come along. Rock ‘n’ roll was his true métier, his muse if you will, and he’s damn well going to let the world know about it. 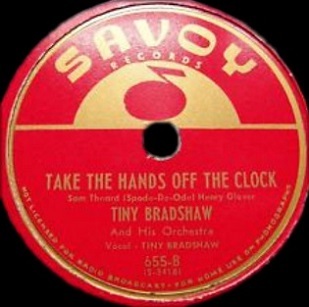 Leave a reply on "Tiny Bradshaw: “Take The Hands Off The Clock”"